Marie Baumgartner (1831-1897). 49 letters 1874-1883. 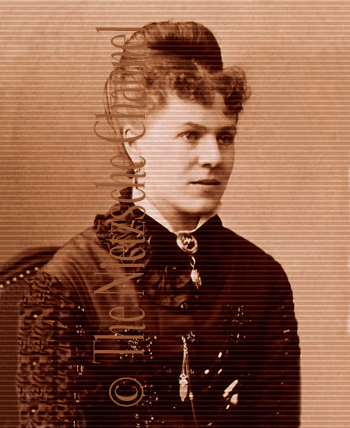 The mother of one of Nietzsche's students, she began a French translation of Schopenhauer as Educator in December 1874, but it was never published. However, her French translation of Richard Wagner in Bayreuth was published in 1877. Carol Diethe makes a compelling argument that Baumgartner was in love with Nietzsche. Georg Brandes (1842-1927). 13 letters 1887-1889. I have been studying philosophy for a long time. I am studying a German philosopher who is living in Italy. His ideas and mine agree so completely that I find him excellent, the only philosopher alive that I have any use for. We have been in touch with each other for a few years. His name sounds strange and he is still unknown. His name is Friedrich Nietzsche. But he is a genius. Lately I have cast off one of my snakeskins. I have turned from the Englishmen back to the Germans in philosophy. English philosophy seems to me to have reached its peak. But my friend N. has the future ahead of him. I am also becoming more radical, less historic and continually more aristocratic in my aesthetic and historic viewpoints. I don't believe for one minute that great men are a concentrate of the mass, are created from below, are expressions of the flock, etc. Everything comes from the great ones, everything is sifted down from them. I am happy for the strong inner life I am living and for the fermentation of my ideas. Stagnation is terrible and shedding skins is real and essential youth. Hans von Bülow (1830-1894). 11 letters 1872-1889. Your kind letter and submission has put me in a dilemma, uncomfortableness which I have seldom felt so vividly in such matters. I ask myself, should I remain silent, or respond with a civil banality—or—just come out with it? [....] But to the point: your Manfred-Meditation is the most extreme form of fantastical extravagance, the most unedifying and anti-musical thing I have seen put down on paper in a long time. Several times I had to ask myself: is the entire thing a joke? Read all of Nietzsche's correspondence with von Bülow in: Friedrich Nietzsche in Words and Pictures. Appendix 2. Chronology of Nietzsche's Music. Jacob Burckhardt (1818-1897). 7 letters 1882-1889. Born into a distinguished Basel family, Jacob Burckhardt was Nietzsche's colleague and professor of history at Basel. His works include The Time of Constantine the Great, The Cicerone "An Introduction to the Enjoyment of the Art Works of Italy," and The Civilization of the Renaissance in Italy. Nietzsche sent Burckhardt a copy of each book he published. See his entry in Deutsche Biographie. Gustav Dannreuther (1853-1923). 1 letter 1882. Gustav Dannreuther was born in Cincinnati, Ohio. He was a pupil of Joseph Joachim and Heinrich de Ahna at the Königlichen Hochschule für Musik in Berlin from 1871-1873. He left Berlin and eventually made his way to London, where he lived as a violinist. He returned to America and became a member of the Boston Symphony Orchestra in 1880. In 1882, he ran the Buffalo Philharmonic. In 1884, he founded the Beethoven String Quartet in New York  taking the name from the Beethoven Quintette Club of Boston, in which he had played  and subsequently renamed it the Dannreuther String Quartet. Dannreuther was the conductor of the Vassar College Orchestra from 1908-1914. His brother Edward (1844-1905), a pianist, was a professor at London's Royal College of Music, and a friend of Richard Wagner. He founded the Wagner Society of London in 1872, wrote Richard Wagner: His Tendencies and Theories in 1873, and translated Wagner's Über das Dirigiren (On Conducting), London: W. Reeves, 1887. Paul Deussen (1845-1919). 39 letters 1864-1889. Nietzsche's friend and classmate at Schulpforta and at the University of Bonn. He wrote about his friendship with Nietzsche in Erinnerungen an Friedrich Nietzsche. Leipzig: Brockhaus, 1901. Unlike Nietzsche, Deussen did not follow Ritschl, their philology professor, to Leipzig but continued at Bonn and later Tübingen and Berlin, studying theology, philology, Sanskrit and philosophy, especially Schopenhauer. Deussen was a professor of philosophy in Kiel, and a renowned Indologist. His works include: Das System des Vedânta and Die Sûtras des Vedânta. See his entry in Deutsche Biographie. Theodor Fritsch (1852-1934). 2 letters March 1887. Jews are, objectively speaking, more interesting to me than Germans: their history yields many fundamental problems. In such serious matters, I am used to keeping sympathy and antipathy out of the question: as these pertain to the discipline and morality of the scientific spirit and—ultimately—even to its sense of taste. 5. That is, in Fritsch's publication—which, of course, would never happen. Ernst Wilhelm Fritzsch (1840–1902). 71 letters 1871-1888. Ernst Wilhelm Fritzsch (1840-1902) was Nietzsche's publisher, from The Birth Of Tragedy to On the Use and Abuse of History for Life. After selling Nietzsche's works to Ernst Schmeitzner, he bought them back in 1886 and began publishing the second issues. He would eventually sell the rights to C. G. Naumann in February 1892. Fritzsch (originally a violinist) also published, from 1870 on, the Musikalisches Wochenblatt, as well as Richard Wagner's collected works (Gesammelte Schriften und Dichtungen). View Nietzsche's December 20, 1873 contract with Fritzsch. Carl Fuchs (1838-1922). 28 letters 1873-1888. Fuchs friendship with Nietzsche began in the early 1870s. A musicologist and music critic, pianist, conductor and composer, he studied piano with Hans von Bülow while attending courses in theology and philosophy at the University of Berlin in the early 1860s. In 1868 he settled in Berlin, where he performed as a pianist; while in Berlin, he also worked for the Musikalisches Wochenblatt. In 1874, Fuchs left Berlin for Hirschberg in Silesia, where he founded and directed a musical society. 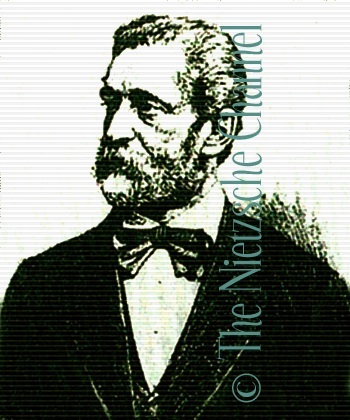 He settled in Danzig in 1879 and held a variety of jobs including: director of the music academy; music teacher; organist at a church and later a synagogue; pianist; and music critc of the Danziger Zeitung. See his entry in Deutsche Biographie. Carl von Gersdorff (1844-1904). 95 letters 1865-1887. Gersdorff first met Nietzsche in Pforta in 1861. He assisted Nietzsche in the early 1870s with dictation and proofreading. 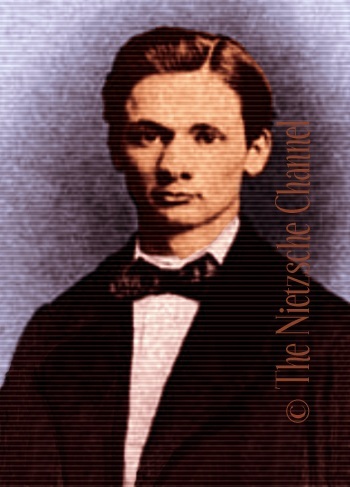 After 1876, they never met again; Nietzsche broke off all correspondence in December 1877. With the help of Heinrich Köselitz, they were reconciled by 1881, and renewed their correspondence. Karl Hillebrand (1829-1884). 2 letters mid-April 1878 and May 24,1883. Hillebrand, a former professor of foreign literature, was an essayist and historian who wrote a piece on Nietzsche's first Untimely Meditation on David Strauss entitled, "Nietzsche gegen Strauss" (Nietzsche vs. Strauss). It was published in the Augsburger Allgemeine Zeitung on September 22-23, 1873, and reprinted in his collected essays Times, Nations and Men. See his entry in Deutsche Biographie. Karl Knortz (1841-1918). 1 letter 1888. Born in Garbenheim, Rhenish Prussia and educated in Wetzlar and Heidelberg, Knortz emigrated to America in 1863 from London, where he was probably working as a private tutor. He taught in Detroit, Oshkosh and Cincinnati and edited a German daily newspaper in Indianapolis. 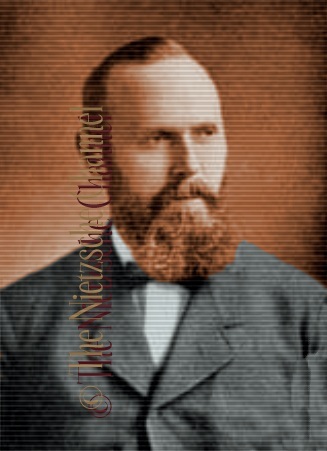 In 1876, he served as principal of a school in Johnstown, Pennsylvania, and married Anna Singer. The couple had a daughter and finally moved to New York. Knortz took up translating and other literary pursuits that failed to pan out. In 1892, he moved to Evansville, Indiana, serving as school superintendent for 14 years. 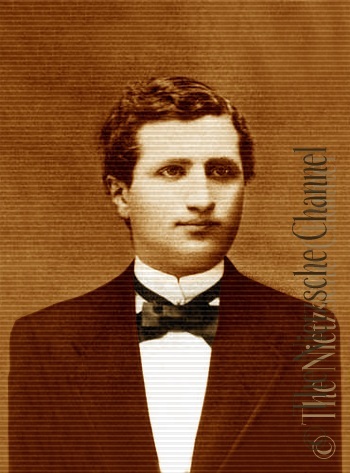 During this period, he wrote his first book about Nietzsche: Friedrich Nietzsche und sein Uebermensch. Zürich; Leipzig: Stern's literarischem Bulletin der Schweiz, 1898. He retired in 1906 and moved back to New York. He settled in Tarrytown and wrote three more works on Nietzsche: Nietzsche's Zarathustra: eine Einführung. Halle: Hugo Peter, 1906; Friedrich Nietzsche der Unzeitgemässe: Eine Einführung. Annaberg in Sachsen: Grafers, 1909; and Nietzsche und kein Ende. Torgau: Torgauer Druck- und Verlagshaus, 1913. For more biographical details, see Peter Assion, "Karl Knortz and His Works." In: The Folklore Historian (1988) Vol. 5, No. 1: 2. Also see the entry on Knortz in Deutsche Biographie. Heinrich Köselitz, a/k/a Peter Gast (1854-1918). 341 letters 1876-1891. 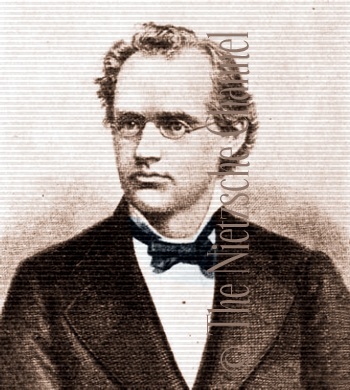 Born Heinrich Köselitz, Gast was a composer who moved to Basel in 1875 to study under Nietzsche and Franz Overbeck. He became Nietzsche's "editor" and proofreader in 1876, after having copied the manuscript Richard Wagner in Bayreuth as a birthday gift for Wagner. A close friend for years, Gast was the one person who was able to decipher Nietzsche's handwriting and worked for Elisabeth Förster-Nietzsche in the Nietzsche Archive from 1900-1908. Mathilde Maier (1834-1910). 3 letters 1874-1878. Your kindness to send me a greeting gives me the courage to thank you from the bottom of my heart not only for it, but also above all for the great, rare joy which "The Birth of Tragedy Out of the Spirit of Music" gives me!— It would be well-nigh impossible for me to give you an idea of how much I am indebted to your splendid book! [....] Everything is splendid! Splendid! Who could read your profound interpretations of these marvelous myths without being filled with a delightful sense of the inexhaustibility of these sources of revelation?— I would not be able to finish at all if I mentioned every flame your book lit for me! I will mention just one: how important it was to me to get an idea at last of the relationship of Socrates to his age and his people, as well as of the remarkable phenomenon himself and his effect on our time! Catulle Mendès (1841-1909). 1 letter (and drafts) January 1, 1889. French poet, critic, and novelist of the Parnassian school. Malwida von Meysenbug (1816-1903). 58 letters 1872-1889. 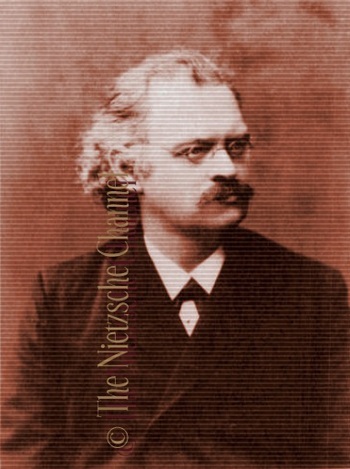 Author and friend of Wagner, Meysenbug first met Nietzsche at the laying of the Bayreuth foundation stone in 1872. In 1876-77, she rented a villa in Sorrento as a retreat for her, Nietzsche, Paul Rée, Reinhart von Seydlitz, and Nietzsche's student Albert Brenner. See her entry in Deutsche Biographie. Elisabeth Förster-Nietzsche (1846-1935). 535 letters 1854-1896. Two years younger than her brother, she kept house for him, on and off, from 1875-1878 in Basel. Her disapproval of Lou Salomé and, especially, her marriage to Bernhard Förstera leader of the German anti-Semitic movement in the late 1870scaused her estrangement from her brother. 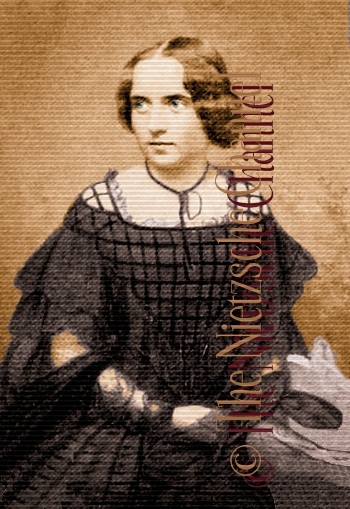 Elisabeth established the Nietzsche Archive, first in Naumburg and then in Weimar. Her suppression, destruction and revisions of Nietzsche's writings were finally exposed in the 1930s. Adolf Hitler attended her funeral in November 1935. Franziska Nietzsche (1826-1897). 612 letters 1854-1888. 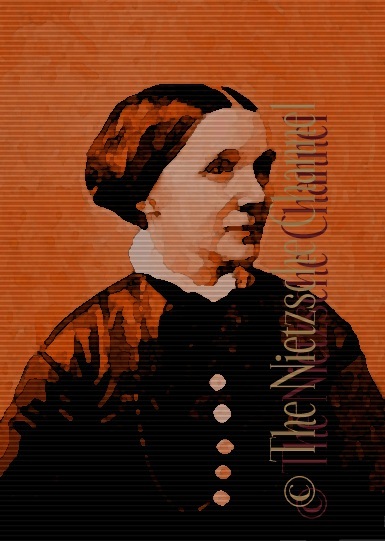 Nietzsche's mother, née Oehler, daughter of David Ernst Oehler, a pietist pastor in Pobles, whose more emotional methods were in contrast to the rational Lutheranism prevalent on the Nietzsche side of the family. 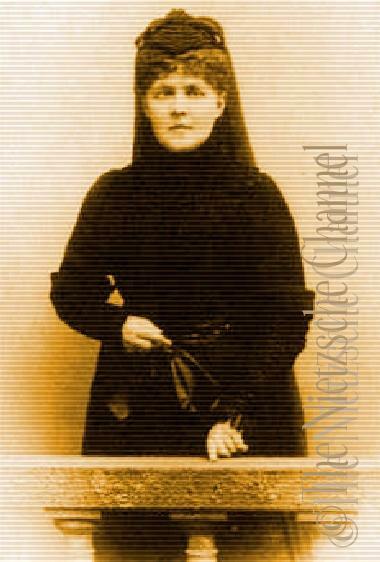 After Nietzsche's collapse in Turin in January 1889, she cared for her son in Jena and Naumburg until her death on April 20, 1897. Louise Ott (1850-1918). 8 letters 1876-1882. Louise Ott (née Louise Félicie Victoire Emma d'Einbrodt), was born in Moscow and grew up in Strasbourg. On August 4, 1870, she married Alfred Ott (1845-1909), a banker. They moved to Paris after the German Reich's annexation of Alsace and Lorraine. Nietzsche met her during the rehearsals of Wagner's The Ring at the first Bayreuth Festspiele in 1876, where she had brought along her three-year-old son, Marcel (1873-1949). Another son was born the following year, Fernand (1877-1936). Louise Ott was a rabid Wagnerian and an accomplished singer. Coincidentally, she was a cousin of Henri Lichtenberger (1864-1941), the author mainly responsible for Nietzsche's early reception in France. In 1897, Ott allowed Lichtenberger to publish her correspondence from Nietzscheshe remained anonymousin order to combat articles touting Nietzsche's alleged misogyny. See Henri Lichtenberger: "Quelque lettres inédites de Nietzsche." In: Cosmopolis. No. 17. Mai 1897. Tome VI. Paris: Armand-Colin; London: T. Fisher Unwin; Geneva: Eggimann; St. Petersbourg: Zinserling; Amsterdam: Kirberger & Kesper; Berlin: Rosenbaum & Hart; Vienna: Hartleben; New York: The International News Co. 1897:460-74. Alfred Ott died in Marly-le-Roi (a suburb of Paris), while Louise died in Switzerland on the 18th of August, 1918. Franz Overbeck (1837-1905). 238 letters 1871-1889. Nietzsche's closest friend, Overbeck became a professor of church history at Basel in December 1869. They lived in the same apartment house for five years. From the time of Nietzsche's departure from Basel (1876) to 1897, Overbeck served as Nietzsche's unofficial business manager, and, together with Heinrich Köselitz, supervised Nietzsche's literary estate after his collapse in Turinuntil Elisabeth Förster-Nietzsche took control in 1893. See his entry in Deutsche Biographie. Ida Overbeck (1848-1933). 10 letters 1879-1883. 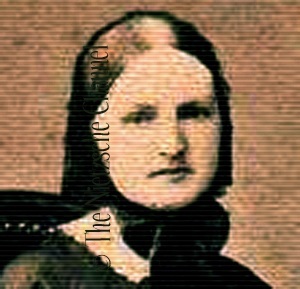 Overbeck's wife, née Rothpletz, whom Nietzsche confided in with regard to his relationship with Lou Salomé and the subsequent disputes with his sister. For more info, see Carl Albrecht Bernoulli, Franz Overbeck und Friedrich Nietzsche: eine Freundschaft. Bd. 1. Jena: Diderichs, 1908: 336-51. Mariano Rampolla, Vatican State Secretary (1843-1913). 1 letter 1889. Mariano Rampolla del Tindaro (1843-1913) was an Italian Cardinal in the Roman Catholic Church and Vatican State Secretary from 1887-1903 under Pope Leo XIII (Vincenzo Pecci, 1810-1903), Italian Pope (1878-1903). Paul Rée (1849-1901). 47 letters 1875-1882. Rée met Nietzsche in the spring of 1873 in Basel, when Rée was working on his dissertation. He wrote on Aristotle's ethics; in 1875 he received his doctorate and soonafter published Psychologische Beobachtungen. Nietzsche wrote him a cordial letter (10-22-1875) on how he liked these "psychological observations" and their seven-year friendship began. Rée introduced Nietzsche to Lou Salomé in 1882. Read Nietzsche's letter to Rée at: Friedrich Nietzsche in Words and Pictures. Part 3. Professor in Basel: 1869-79. Erwin Rohde (1845-1898). 126 letters 1867-1889. A fellow philology student with Nietzsche in Leipzig, Rohde became a professor of philology at Kiel in 1872 and later a famous classical philologist. In 1878, their friendship soured after Nietzsche's publication of Human, All Too HumanRohde thought Nietzsche should remain a classical scholar. In 1886, Rohde revealed his disappointment in Nietzsche's "hermit's visions and mental soap bubbles, which surely give a hermit amusement and diversion; but why convey that to the world, like a kind of gospel?" See his entry in Deutsche Biographie. Meta von Salis (1855-1929). 14 letters 1884-1889. Barbara Margaretha von Salis-Marschlins, a/k/a Meta von Salis, met Nietzsche in July 1884 in Zurich. She was the first Swiss woman to receive a doctorate (in history, from the University of Zürich). An ardent feminist, she told Nietzsche that the title of doctor did not mean much to her but "in the interest of the women's question" she was bent on receiving it. Salis visited Nietzsche in Sils-Maria in 1887, and in 1888 gifted him 1000 francs to help pay for the self-publication of his works. In 1897, she purchased the Villa Silberblick in Weimar for the Nietzsche Archive and to house Nietzsche and Elisabeth. Her friendship with Elisabeth terminated one year later and Salis sold the house shortly thereafter to Adalbert Oehler. Elisabeth gained title to the house in 1902. Salis wrote her own account of her friendship with Nietzsche in Philosoph und Edelmensch. Ein Beitrag zur Charakteristik Friedrich Nietzsche's. Leipzig: Naumann, 1897. Lou Salomé (1861-1937). 33 letters 1882. The daughter of a Russian general, she met Rée and Nietzsche in 1882. She went on to marry Carl Andreas in 1887, became a mistress of Rainer Maria Rilke, and, much later, developed a friendship with Sigmund Freud. Read more about Salomé at: Nietzsche Hauptseite. Ernst Schmeitzner (1851-1895). 115 letters 1874-1886. 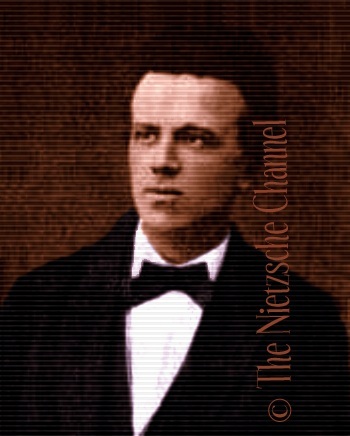 Ernst Schmeitzner began publishing Nietzsche's works with the third Untimely Meditation: Schopenhauer as Educator. Nietzsche and Schmeitzner had a contentious relationship. Nietzsche was disgusted that his books were not being properly promoted and that his writings were "completely buried and unexhumeable in this anti-Semitic dump" of Schmeitznerassociating him with a movement that should be "utterly rejected with cold contempt by every sensible mind." Nietzsche won a lawsuit against Schmeitzner and used the proceeds to purchase a marble slab for his father's grave. Reinhart von Seydlitz (1850-1931). 23 letters 1876-1888. Seydlitz was a writer and artist, whose friends included Liszt, Wagner and Malwida von Meysenbug. He met Nietzsche at the Bayreuth Festspiele in 1876. In 1877, Seydlitz spent several weeks with Nietzsche in Sorrento. Their correspondence continued until Nietzsche's collapse in Turin. For more info, see Nietzsche's Library: Research Material. Reinhart von Seydlitz (1850-1931). Carl Spitteler (1845-1924). 13 letters 1887-1889. A former student of Franz Overbeck, Spitteler was a Swiss journalist and poet, who received the 1919 Nobel Prize for Literature for Olympian Spring. Spitteler's review of Nietzsche's works ("Friedrich Nietzsche in seinen Werken") was published in Der Bund (Bern, Nr. 1 on 1-1-1888, 3-7). He also reviewed The Case of Wagner for Der Bund (Bern, Nr. 309 on 11-8-1888). Spitteler wrote his own account of his relations with Nietzsche in Meine Beziehungen mit Nietzsche, München: Süddeutsche Monatshefte, 1908. Heinrich von Stein (1857-1887). 9 letters 1882-1885. A protégé of Malwida von Meysenbug, Stein came from an officer's family in the Rhön mountains. He was hired by Richard Wagner as a tutor for his son. Stein was the author of Die Ideale des Materialismus (The Ideals of Materialism, Köln: 1878), Helden und Welt: Dramatische Bilder (Dramatic Scenes: Heroes and the World, Chemnitz: 1883) and Die Entstehung der neueren Ästhetik (The Origin of the New Aesthetics, Stuttgart: 1886). See his entry in Deutsche Biographie. August Strindberg (1849-1912). 5 letters 1888-1889. Umberto I, King of Italy (1844-1900). 1 letter 1889. Umberto I was born March 14, 1844. The eldest son of King Vittorio Emanuele II of Italy and of Archduchess Adelaide of Austria, he succeeded to the throne on the death of his father on Jan. 9, 1878. He was assassinated on July 29, 1900. 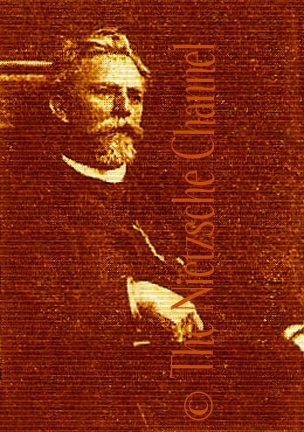 This photograph of Umberto I was mistaken for Nietzsche, and even erroneously used on the cover of two books on Nietzsche in Italian. See Maurizio Ferraris, "Una foto scambiata: banale errore o rivelazione metafisica?" In: La Stampa. Feb. 1, 2000. She was the daughter of Franz Liszt, and was married to Richard Wagner. *She destroyed all of her correspondence with Nietzsche. 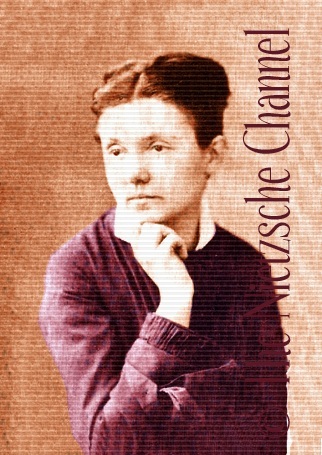 Read excerpts from her diaries re Nietzsche. Her diary indicates that "Ariadne" received at least three love notes from "Dionysus" at the time of Nietzsche's mental collapse. "My wife Cosima brought me here," Nietzsche told his doctors at the psychiatric clinic in Jena in March, 1889. *Cosima Wagner destroyed all of her correspondence with Nietzscheand who knows how much between Richard Wagner and Nietzsche. Nietzsche and Wagner first met in November 1868. See his entry in Deutsche Biographie. Paul Heinrich Widemann (1851-1928). 9 letters 1876-1886. 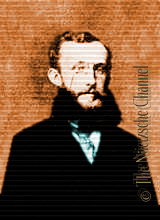 Nietzsche's former student, composer, author, and friend of Heinrich Köselitz. His father was the lawyer for Ernst Schmeitzner, one of Nietzsche's publishers. Widemann was the author of Erkennen und Sein. Karlsruhe; Leipzig: Reuther, 1885. Nietzsche was annoyed with Widemann's conflation of the ideas of Eugen Dühring with his Zarathustra. See Erkennen und Sein: 239. Heinrich Wiener (1834-1897). 1* letter ca. January 4, 1889. Jurist and "Senatspräsident" in Leipzig. Nietzsche met him in 1887 while staying in Sils-Maria. *He also sent him copies of On the Genealogy of Morality and The Case of Wagner. Wiener first worked as a prosecutor in the Prussian civil service. From 1867 until his appointment to the Reichsoberhandelsgericht he was a lawyer and notary. In 1879 he moved to the Supreme Court, where he heard cases for many years in the 1st Civil Division before being appointed in 1891 as president of the 5th Civil Division. In 1892 he became a member of the stock exchange commission of inquiry, and left the judiciary. He retired in 1896. See his entry in Deutsche Biographie.